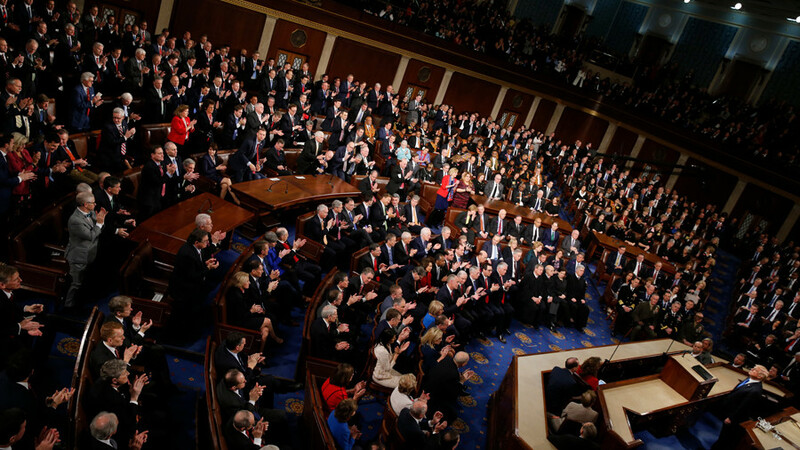 Trump supporters interrupted last night’s State of the Union address on 115 occasions with resounding applause, despite much criticism of the president within his own party. Does such conformity speak well of a democracy? At 5 o’clock on Wednesday morning, with Moscow slowly digging itself out of an overnight snowstorm, I decided to do something I haven’t done in many years: watch a live broadcast of the State of the Union address, starring one of the most divisive presidents in US history, Donald J. Trump. 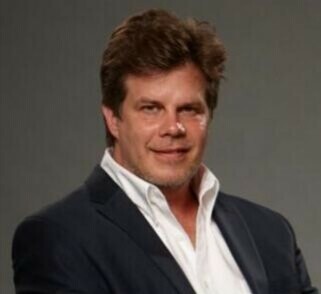 Having lived overseas for two decades, it is always instructive to catch the occasional American pageant – from the Super Bowl to the Academy Awards – in an effort to gain some valuable insight into the real ‘state of the union’ that no teleprompted words from a president could adequately convey. What I did not expect to take away from Trump’s 80-minute political theater, however, was a heavy dose of culture shock and awe. Not even the mighty Trump could mitigate the oppressive, rigid conformity of the entire affair. The spectacle of watching the Republicans punctuate Trump’s speech with numerous standing ovations and applause brought to mind a Soviet-era Politburo meeting where the attendees seem locked in a feverish contest to see who can applaud the longest. 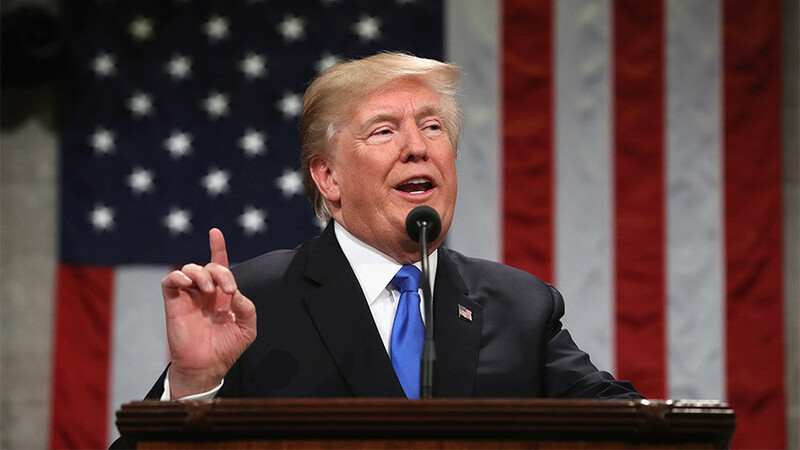 According to the mainstream media’s applause-o-meter, Trump’s first SOTU generated exactly 115 rounds of hand-clapping, which came close to breaking the modern record (Bill Clinton holds the record with 128 breaks during his 90-minute 2000 speech). I would imagine that even the fiercely conformist North Koreans would be hard-pressed to match that level of exuberance for their leader Kim Jong-un. And it will certainly pain many members of the media to admit that Barack Obama was interrupted an average of just 90 times, while George W. Bush got 80 rounds of applause during his addresses. In order to put this bizarre clapping craze into its proper perspective, consider that Dwight D. Eisenhower and John F. Kennedy – respectable leaders in their own right – averaged just 30 to 40 applause breaks, which comes out to be less than half the number recent American leaders have had. While watching this display of hand-clapping insanity, I had to ask myself: Is such behavior more conducive to a group of groveling sheep as opposed to that of independent, strong-minded individuals? 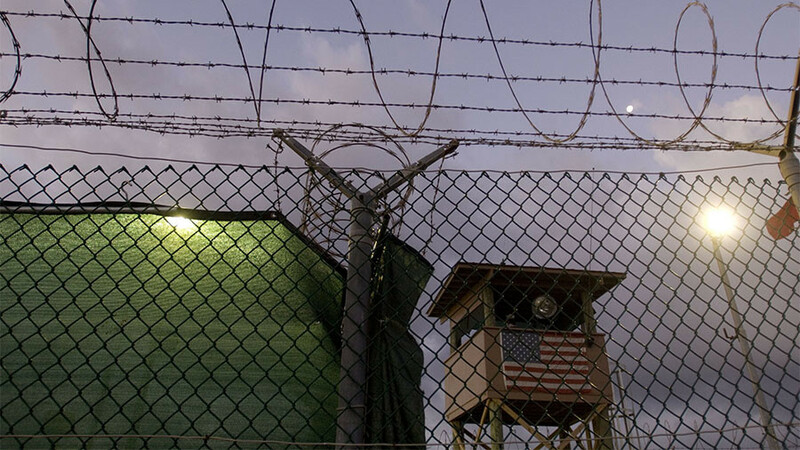 An authoritarian state as opposed to a healthy democracy? Here's a thought experiment: What do you suppose would happen to the career of any Republican who failed to join along in the ardent applause for Great Leader? Ostracism from the self-righteous ranks? And the same could be asked of any Democrat who may have ventured a muted golf clap or two for the Republican leader. Tellingly, one of the only moments of unity between the Democrats and Republicans arose when Trump spoke about defeating Islamic State (IS, formerly ISIS), thus proving the maxim that nothing can unite this nation more than an external enemy. Needless to say, that comment raised some eyebrows, and not least of all in Russia, which contributed a significant amount of military prowess in routing IS. It deserves mentioning that the only time the Democrats found Trump to be presidential material in his first year in office was when he bombed a Syrian airport. That speaks volumes about where we’d be today had establishment darling Hillary ‘We came, we saw, he died’ Clinton been elected. But I digress. 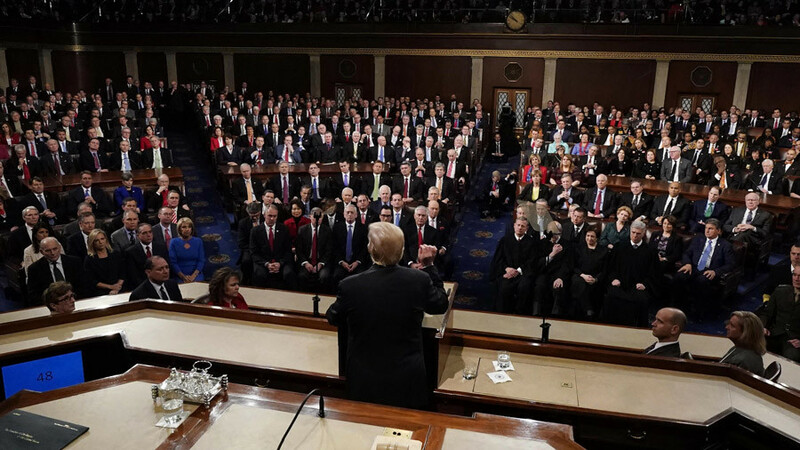 Thankfully, some much-needed comic relief was provided during the speech, mostly from watching the stony faces on the other side of the hall – in this particular case, the Democrats – as Trump proudly rattled off last year’s achievements. The scowls from the Democrats went a paler shade of white when the Republican populist dared to draw attention to record-low black unemployment rates, for example, and those people who refused to stand and honor the flag during the singing of the national anthem, and how he was determined to resolve the country’s immigration problem. This unfortunate comment is a reflection of a lengthy media campaign that continues to peddle the news – without providing a shred of evidence – that Trump somehow colluded with the Russians to emerge victorious in last year’s election. Once again, many Americans are conforming to an unsubstantiated idea that has been foisted upon them without rhyme or reason. Few are brave enough to challenge this fake news blitz, since doing so would risk career. Meanwhile, the left-leaning media is already complaining that Trump only mentioned Russia once in his speech (while the bad guys at Islamic State got a disproportionate six mentions). “Around the world, we face rogue regimes, terrorist groups, and rivals like China and Russia that challenge our interests, our economy and our values,” Trump said. Apparently that criticism of Russia fell short of Democratic expectations, especially considering that Barack Obama regularly placed Russia into the same category with Islamic State. So as the bright lights dimmed on yet another State of the Union Address, a thought came to mind: Why are there only two parties year after year expressing their increasingly conformist beliefs in the halls of power? Why the mindless, ritualistic applause for two short-sighted groups, that are engaged in an endless game of back-and-forth regarding America’s future? This shockingly high level of conformity, I believe, is symptomatic of America’s two-party political system, which dramatically reduces the options available for everyday Americans when forced to consider political topics of great import. Yet poll after poll shows Americans want and need a third political brand to choose from. 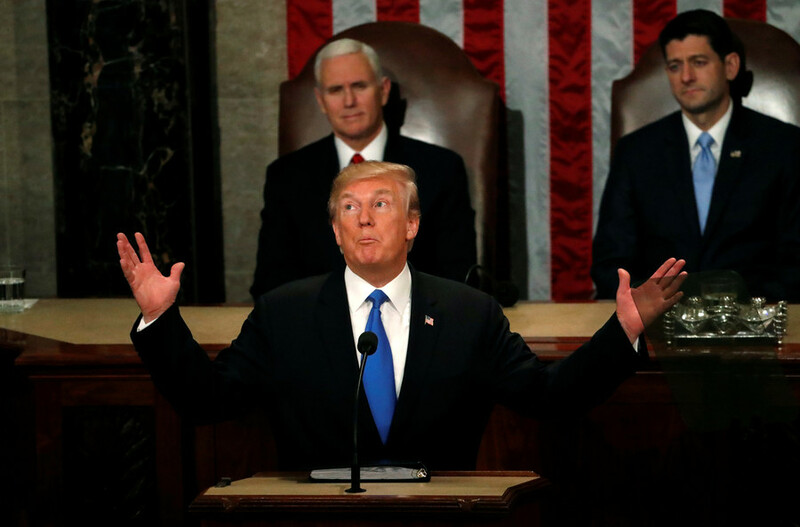 What was conspicuously missing from Trump’s State of the Union Address was not rapturous applause and standing ovations. What was missing was a third voice in a third section of the Capitol to lend some credence to this Soviet-style political show.